My wish is for "gay" to stop being an insult. My wish is every Canadian is treated equally and supports LGBT rights. I wish for more LGBTQ2A bathrooms and more human rights. Lets be treated the same. Less Taxes. I wish that in the future gay marriage will be accepted globally. All LGBT have the right to be equal. I think trans people should have their own bathroom so they don't have to be awkward or not know which one to go to. I wish that in the next 150 years we can make the environment feel safe and comfortable for the LGBTQ+ communities members. My wish is for communities to express more acceptance to LGBTQ+ people. My wish is for more LGBTQ+ education to promote acceptance. My wish is for more LGBTQA+ representation in the media and political realm. Especially asexual community members aren't often represented in the media like other LGBTQA+ members, which we need for people to understand the identity. My wish for Canada is for more people to support LGBTQ as there are too many people committing suicide in the LGBTQ community. Speak up more about LGBTQ rights. That we work towards creating more equal opportunities for people when it comes to human rights and LGBTQ2A. I think that we have come further in creating equality by doing the "pride parade" and our Prime Minster working towards more awareness of the LGBTQ2A+ community. I do believe that we could do more by creating more gender-neutral washroom in all public places and creating more communities available in schools and in our towns/cities that would make people more educated and included in the LGBTQ2A+ community. I think we need to continue to work towards better human rights for everyone, neither that be gender equality in all opportunities or racial equality in all circumstances, etc. Making a difference won't be overnight and making a change towards something you believe in will take effort and perseverance but don't think that it is impossible. We have to work together as not only a community but a nation and learn to undertand that there is not a difference between any two individuals but we are all seen on the same level. Everyone should have equal opportunity and rights to anything that is presented to them. Issues like gender-neutral washrooms should be more accessible to the everyday public and not put people into two gender categories. Also bringing conversations uu towards topics like these will help elevate stigma. We should also get to a point in society where coming out isn't a thing and it's just seen as who you love and you are. Celebrate who you are. My wish for Canada is 1) LGBTQ2A rights because they are still people -you should welcome people and not turn them away. 2) help people with any mental and physical issues. 3) indigenous rights 4) cultural and historical presevation 5) new Canadian and immigration and ntergration 6) human rights. My wish for Canada is: 1) for more environmental sustainability 2) LGBTQ2A rights and acceptance into certain things like afterschool sports and programs. Just because they're different doesn't mean they're not human. My wish for Canada is to accept the LGBTQ2A community. #lovewins. Everyone should have the right to love who they love and be who they want to be. All equality for LGBTQ2A members and way more diversity. 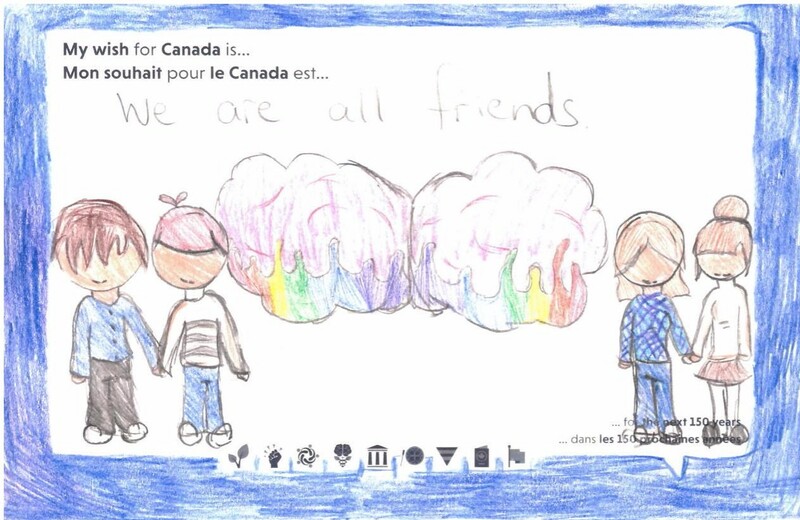 My wish for Canada is for everyone to be equal, including all genders, the LGBTQ!A community, and all races. My wish for Canada is for people to be proud of their sexuality. My wish for Canada is for more women and LGBTQ2A of colour to be represented in Canadian media and politics. My wish for Canada is for society to have a better understanding of LGBTQ!